Greensboro, N.C. – In an era of economic upheaval, shifting markets and rapidly changing technology, organizations must become engines of continual learning to jump-start and sustain success. But how do they build learning — and the ability to act on the resulting knowledge — into their DNA? The Center for Creative Leadership (CCL®) finds there is no substitute for strategic leadership — the ability to create direction, alignment and commitment at every level to reach an organization’s full potential. Becoming a Strategic Leader: Your Role in Your Organization’s Enduring Success, 2nd Edition, published by Jossey-Bass, offers a comprehensive approach to strategic leadership, drawing on CCL’s highly regarded Leading Strategically open-enrollment program. 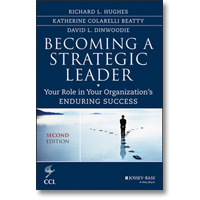 Authors Richard L. Hughes, Katherine Colarelli Beatty and David L. Dinwoodie have worked together at CCL for 15 years, personally helping more than 2,000 leaders and dozens of organizations around the world tackle their toughest leadership challenges. Their book emphasizes three essential strategic elements — discovering and prioritizing strategic drivers; developing a leadership strategy; and fostering individual and organizational learning. Hughes, a former CCL senior faculty member, served as transformation chair and academic department head at the U.S. Air Force Academy. Beatty is managing director of CCL’s Colorado Springs, CO campus, and Dinwoodie is CCL’s regional director for Latin America. “Chock-full of tips and tools, this book puts ‘strategic’ within your reach with practical guidance for those seeking to learn this important skill,” said Mary Ellen Smith, corporate vice president of operations at Microsoft. Written for executives, middle managers and junior managers — who all play critical roles in designing and implementing strategic leadership — this updated edition includes enhanced self-assessments that help leaders identify strategic gaps in their organizations’ approach to leadership.